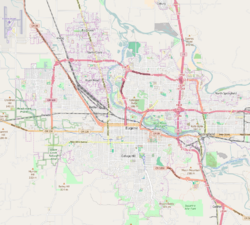 The Oregon Electric Station is a restaurant in Eugene, Oregon, United States. It was originally built in 1914 as a station for the Oregon Electric Railway and was designed by A. E. Doyle. Passenger service by the Oregon Electric Railway was discontinued in 1933, and the station was used as an office and for storage. 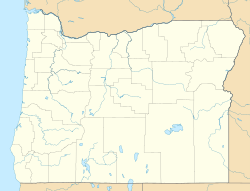 In 1961, the station became a branch of the Oregon Museum of Science and Industry (OMSI), the Southwest Oregon Museum of Science and Industry (SWOMSI). After breaking with OMSI in 1978, the Willamette Science and Technology Center (WISTEC) sold the station and gave the proceeds to Lane County to build a children's museum in Alton Baker Park. SWOMSI's displays included train cars adjacent to the building. Those train cars are now part of the current restaurant's dining facilities. Work began to convert the station into a restaurant in 1977. The first restaurant in the space was called "Andy's Eugene Station". The station was listed on the National Register of Historic Places, as the Oregon Electric Railway Passenger Station, in 1979. ^ "This Week In History". The Register-Guard. May 13, 2007. ^ "Oregon National Register List" (PDF). Oregon Parks and Recreation Department. June 6, 2011. Retrieved June 19, 2011. This Oregon train station-related article is a stub. You can help Wikipedia by expanding it. This page was last edited on 22 January 2019, at 02:05 (UTC).